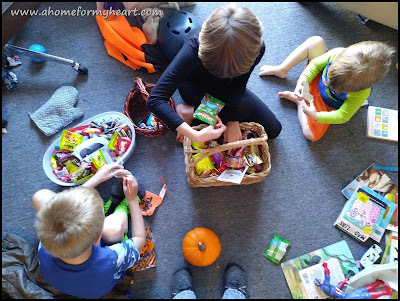 Getting the kids into costumes and getting out the door to trick-or-treat was easier this year than last year. But this year I know how bad candy is for me, and I ate a ton anyway. I'm still waiting for the headache and legarthy to hit. Have the costumes ready early in the month! I browsed the costumes at the thrift store each week when I did my donation drop off. I was fortunate that 2Flowers wanted to be something easy this year. 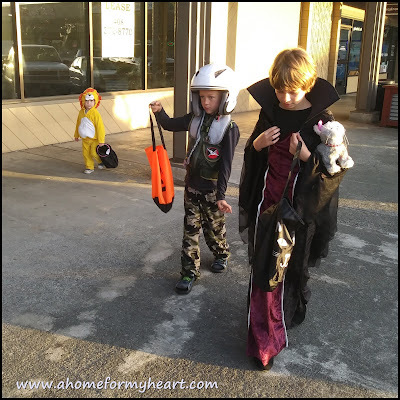 We found a witch hat at the Dollar Store and a vampire dress at the thrift store where we had credit. Her costume was complete by a week before Halloween and I didn't have to stress about pulling it together. I ended up with FOUR costumes for Davey! 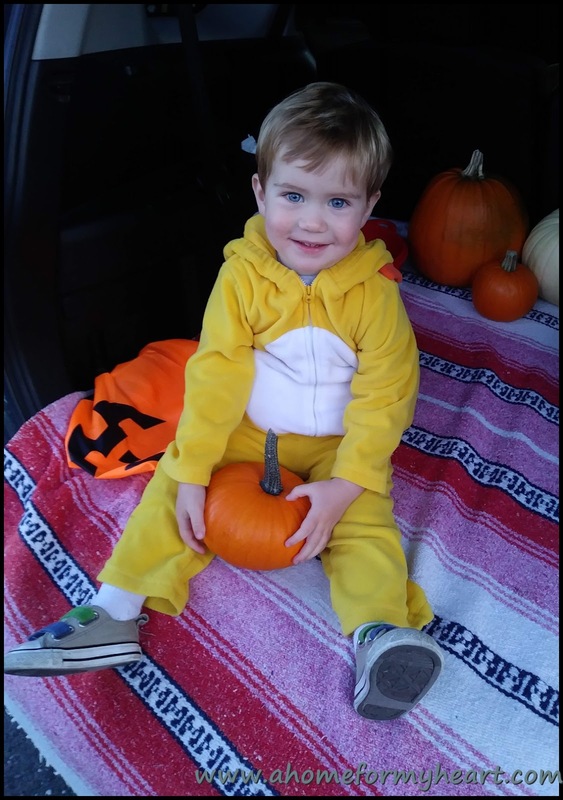 One from a friend who gave me a costume last year, one from the Pregnancy Care Center (an amazing second hand charity in the area), one from the thrift store (Free, because I had credit! ), and another one from somewhere... The hard part was picking which one to use. Orion was cool with the fighter pilot idea (Whew!) and already had a pair of camo pants that (amazingly!) were clean. And Lost Boy's old motor scooter helmet (which has been a dress-up for a few years) really made the outfit come together. I felt relieved that the costumes came together easily this year. Lost Boy had school, and was gone from 8:00 am to 7:00 pm, so I was on my own. I had about ten activities scheduled into my calendar for Halloween afternoon and evening. But I only had to be at one. When Orion spazzed out (probably due to sugar from the party at school combined with excitement for the evening), I cancelled the trip to the library for Halloween crafts. We also didn't get started early enough to do the trick-or-treating Downtown. We did hit the strip mall a few blocks away. And I think that Orion would have been happy with what he got from that circuit, but we had the ward Trunk-or-Treat, too. 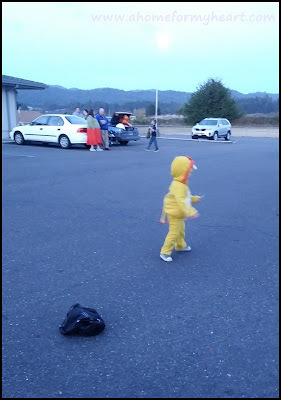 The Trunk-or-Treat was a low profile activity. We didn't plan a ward dinner, carnival or harvest festival to go with it. We just pulled in, visited in the parking lot for a little bit, then told the kids to get going. 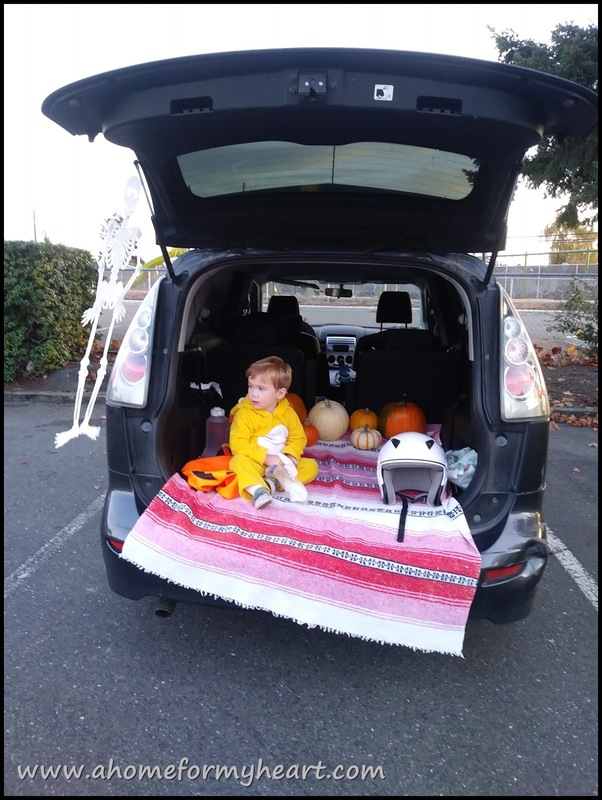 We started before dark, which I really like, because then I can SEE all the cute kids, and all my ward friends, and the decorated cars. Davey had a complicated relationship with his candy bag. He didn't really get why people kept putting candy in his bag. He did understand that you're supposed to walk up to people and they give you candy. But the candy was supposed to go from their hand, to his hand, to his mouth. No bag. After the Trunk-or-Treat we had a 14 year old friend with us and we went around our neighborhood. The little boys were so tired. But it was nice for Lilli to have a friend to go up to the door with. When we settled down for Scriptures & Prayer with Lost Boy, we had a chance to admire all the candy the kids brought home. I have never seen so much candy in one place in my life. Now what are we going to do with it?